A food scientist, no less! While it's true that I've been properly educated in the fields of both chemistry and food science, it's also true that I haven't really called upon that knowledge very often over the past six years, except for what's typical in any frequently used home kitchen environment. So much of what I learned has either a)evaporated into thin air, or b)disappeared into the deepest recesses of my brain, probably never to be heard from again. I say all this because I need to feel better about the blunders I make from time to time. My most recent "Doh!" moment came while making my first batch of jam this year. I had a hard time finding pectin in the grocery store (no one seems to know what it is! ), and what I finally found didn't turn out to be what I had in mind. I began making the following recipe and when it came time to mix the pectin in the water, it didn't look quite right. It was then that I realized I had purchased instant pectin rather than classic. Fortunately, I had time to correct myself and everything turned out okay. The jam I made had the perfect consistency for spreading onto bread without ripping it to pieces (a pet peeve of mine!) and a balanced sweetness that tasted wonderful with the bite from the balsamic vinegar. For the longest time, I couldn't understand why people liked strawberries and balsamic vinegar together, but I'm happy to report that my taste buds have awakened and I finally get it. The next time you have a snafu in the kitchen, keep in mind that it happens to everyone, even those who have a couple of degrees related to such things. Combine crushed berries with lemon juice in a large bowl. Add sugar, mixing thoroughly. Let stand 10 minutes. In a small saucepan, combine the water and pectin; bring to a full rolling boil that cannot be stirred down, stirring constantly. Boil hard for 1 minute, continuing to stir. Add cooked pectin mixture to fruit mixture and stir for 3 minutes, then stir in the balsamic vinegar until well blended. Ladle or pour jam into sterilized freezer jars, leaving 1/2-inch headspace. Apply clean,dry lids and let jam stand in refrigerator until set, about 24 hours. You can refrigerate this jam for 3 weeks or so or freeze up to 1 year. Gorgeous! But where is the butter?! I must have a layer of butter between bread and jam. 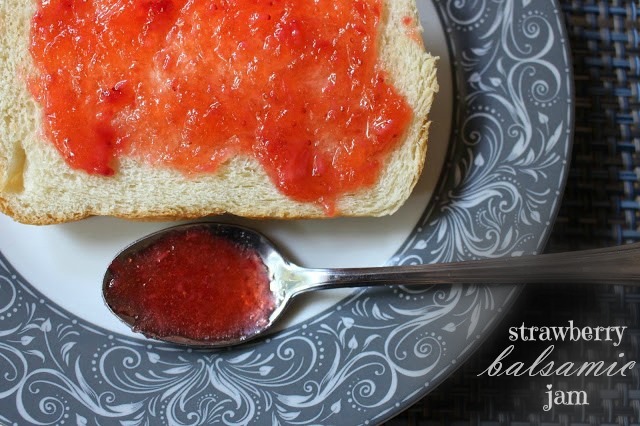 Strawberry jam is my favorite, but I've never tried strawberry balsamic jam! Everything about this sounds good. YUM! Great consistency indeed! This jam looks divine. Strawberry balsamic sounds lovely, and the consistency looks perfect. Now, if only I managed to catch kitchen errors in time to correct them! Errors always happen. When you can fix them, life is good. When they turn our really well, like this one did, life is great! Oh this sounds lovely! As soon as I have garden fresh berries, I will try this! Strawberry jam is my son's favorite! This one looks delicious and I can picture him devouring it in moments! Cute story. I'm glad it worked out in the end. You haven't forgotten all your Food Science training. If that were the case, you wouldn't have been able to remedy the error! I'm sure even the most decorated of food scientists make kitchen mistakes at times...I know I've certainly been there!! Glad that it has turned out well. Homemade jam is the best. I love the balsamic addition! It must be delicious! Thank you so much for sharing the story with us! We're learning all the time! I don't know about you, but I run to Google and am always amazed how many other people have the same problem! Your jam looks delish, Grace. The balsamic adds such an interesting flavor to fruit. My mother used to make a jam without pectin...freezer jam she called it. Going to dig out the recipe. I did a course on food science at uni only two years ago, and as interesting and fun as it was, have not used a single thing I learnt in that course (not that I remember much of it of course!). I have a vague memory of learning about pectin other than knowing that I've heard of the name in class have no idea what we learnt about it. If only we had practicals where we made amazing looking jam like yours! I have been having so much fun home preserving the past couple years! Love the balsamic addition. I love strawberry freezer jam. I've never thought to add balsamic to mine - I can't wait to try it!!! That's great looking jam, Grace. I love the addition of balsamic vinegar. I make most of my jams without pectin and I like the way they turn out.